I also have several years of experience in engineering where I designed and supervised a large number of projects used both for astronomical research and industrial applications. Using funds made available through my Canada Research Chair in star formation, I am now in the process of establishing a research laboratory that will allow the development of state-of-the-art instrumentation for submillimetre observatories and astronomy. The initial projects will consist of the development and testing of submillimetre polarimeters for molecular lines and dust continuum measurements. Fig. 6. 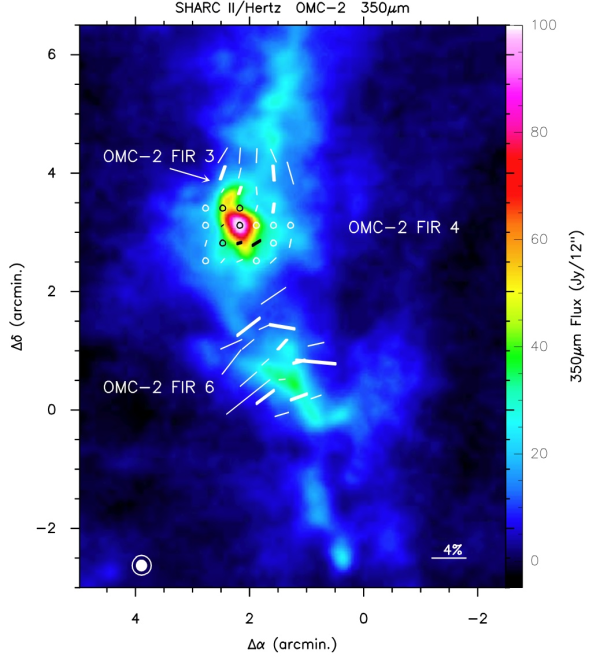 A 350-μm continuum map and polarimetry (E-vectors) of the OMC-2 region obtained at the Caltech Submillimeter Observatory with SHARC II and Hertz, respectively.